After a successful spot the differences application for all ages, Mayuir Sidhpara has created an all new version just for kids! The artwork and gamepack choices are ideal for children and focus on everyday situations! This application greatly improves on the previous one, making it user friendly and motivating for children! 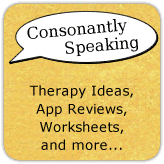 Continue reading to learn how you can use this application in speech therapy sessions! The Main Page of the application shows children looking at a board with different scenes on it. There are also buttons for viewing a certificate of completion and for parent/teacher information. You have the ability to reset levels and view more applications by the developer on this menu. Two scenes will then be shown with three differences between them. Once the user finds each difference, have him or her press on the right image where the difference is located. There is no time limit and there are no penalties for pressing the wrong spot. When a difference is found, a circle with a check mark will appear where pressed. Once all three differences are found, a message of praise will appear as well as the "Next" button. If you need a hint as to an area in which to search for a difference, press the "Hint" button and a large circle will appear. Once a gamepack has been played through, the user will get a star for completion (shown on the pack's image and the certificate). Then, the application states to go and master the other gamepacks. 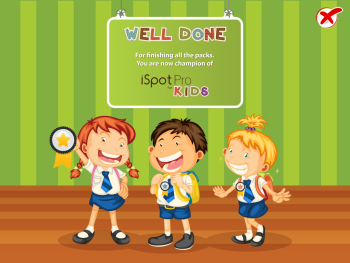 Once all gamepacks are mastered, a new image will show stating that the user is a champion of iSpot Pro for Kids! You can view the certificate at any time in the app by pressing on the certificate button on the Main Page. To reset all of the levels, go to the Parents/Teachers Menu. The art for this application is wonderful and images relate to everyday tasks that children partake in. This is great for talking about vocabulary, what to expect when you visit certain places, and routines! The fact that there are hints is great for children who have difficulty finding differences and may become frustrated. 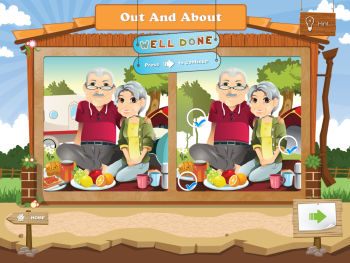 There are 35 different image pairs within the seven different gamepacks. The developer of this application stated that in a future update, there will be sound! I am looking forward to that! If a child finishes an image set or more, but not the entire gamepack, it would be great if the application would return to the point at which the child left off instead of starting all over. Memory Skills - Have the child look at the image on the left hand side of the app. Cover it up and have the child try to determine the differences from memory. Receptive Language - Have children name as many items as they can in the image. 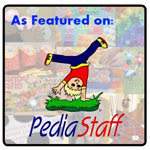 Have children place items in a category or discuss how items relate to the theme of the pack. Also, discuss how things are the same and different between the images. Expressive Language - Children can create a stories based on the images shown. Life Skills/Routines - Choose the "Home" gamepack to discuss different everyday tasks such as brushing teeth, washing dishes, and getting ready for bed. Choose the "School" gamepack to discuss routines at school such as getting on the school bus and attending different classes. Talk about the sequence of events that happen in these events. Pragmatic Language - Choose the "Playing With Friends" gamepack to discuss what is happening in the different images, what the children might be saying, how to initiate a conversation, how to join a group, etc. 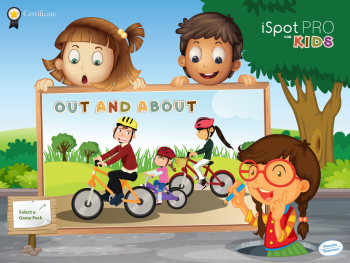 iSpot Pro for Kids is available for the iPad and iPad Mini for $1.99.